This is my reply to Miss Maryam,a blogger I know through word press.I was nominated for “Very Inspiring Blogger Award“.I wonder when did I inspire someone(knowingly or otherwise),but let’s focus on things that matter,I’d like to thank her for the nomination.I having been talking and using this blog to write whatever is on my mind and I’ve been trying to do this very honestly.So far I have 90+ posts and soon the number will turn to 100 posts,and I’ve had incredible audience and support all this time. A man working hard to earn,to feed his family inspires me.I’ll tell you why-because what matters to him the most is his family and his will to survive,he works hard and that’s something we all need to do.Be thankful for who we are,where we are and with what we have. People who help others,I need not say more but they are the heroes to me.They are an inspiration. And in the end,I’d say that the bloggers here are my source of inspiration.What I read here is true,not fabricated and totally original.Here I get to read things that I might never ever read in a book,or in some article in a magazine or a newspaper. Don’t worry with the rules(for now) because I’m not nominating anyone particular here,not any single blog.I have been reading your material for quite a long time and you all have inspired me(more or less). 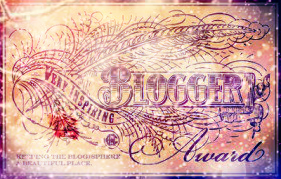 The rule originally said to nominate around 15 blogs(which I failed to). Also list three things that inspired you this week(this week was low for me,so I have listed in general whatever inspires me). I must thank the one who nominated me again,you can check their blog by following the link below. Sorry for breaking the rules and thank you for reading.Thank you for being so amazing.